A continent is a large area of the land on Earth that is joined together. 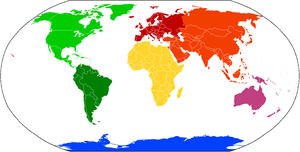 In general it is agreed there are seven continents in the world: Africa, Antarctica, Asia, Europe, North America, Australia or Oceania, and South America. The most populous continent by population is Asia followed by Africa. The third most populous continent is the Americas. The fourth most populous is Europe and then Oceania. In sub-Saharan Africa, the largest age group are denarians (in their teens). In north Africa the largest age group are vicenarian (in their twenties). In Europe, most people are tricenarian (in their thirties) or quadragenarian (in their forties). Some sources say that Australia is one of the seven continents. Others say that Australia is part of Oceania. Oceania is a region which includes Australia, New Zealand and the Pacific Islands. The third alternative is the term Australasia, which includes at least all countries on the Australian continental plate. This includes the islands of New Guinea, Tasmania, New Zealand and a number of smaller islands. It is on the south-eastern side of the Wallace Line, with distinct differences in its biology from the Asian side of the line. "It includes all the islands of the Malay Archipelago... as well as the various groups of islands in the Pacific. The term has been used in very different senses". North America and South America are often described as "the Americas". This has the advantage of including Central America and the Caribbean islands. Otherwise, Central America is counted as part of North America. Eurasia is not really an alternative, it is a recognition that the landmass of Europe and Asia are continuous, and some of its largest countries are in both continents. Russia extends from eastern Europe to the far east of Asia without a break. The Ural Mountains, which run roughly north/south, are the traditional dividing-line between Europe and Asia. For many purposes it is convenient to consider the great landmass as a single continent, Eurasia. When British people talk about "the Continent" (or "Continental" things) they mean the European mainland. This meaning is not used as much as it used to be, but is still seen in phrases like "Continental breakfast" (rolls with cheese, jam etc. as distinct from an "English breakfast" which is a cooked breakfast). Continents not only move but also sometimes move against each other. The Indian subcontinent has been colliding with the Eurasian continent for a while now. As these continents push against each other, they buckle and bend. Because of this, the Himalaya Mountains, where Mount Everest is, are still being made today. Zealandia is an almost entirely submerged land mass, and 93% of it still remains under water. Zealandia may have broken off the Australian plate between 85 and 130 million years ago. ↑ "Continents: What is a Continent?". National Geographic. Retrieved 2009-08-22. "Most people recognize seven continents—Asia, Africa, North America, South America, Antarctica, Europe, and Australia, from largest to smallest—although sometimes Europe and Asia are considered a single continent, Eurasia." ↑ "Map And Details Of All 7 Continents". worldatlas.com. Retrieved 6 March 2016. ↑ "These maps show where the world's youngest and oldest people live". Public Radio International. ↑ "Australia - Oceania :: Australia — The World Factbook - Central Intelligence Agency". www.cia.gov. ↑ "Australia Map / Oceania Map / Map of Australia / Map of Oceania - Worldatlas.com". www.worldatlas.com. ↑ "Encarta World English Dictionary". Bloomsbury Publishing Plc. 2007. Archived from the original on 2009-10-31. Retrieved 2008-08-05. ↑ Earth Science. United States of America: Holt, Rinehart and Winston. 2001. p. 211. ISBN 0-03-055667-8. ↑ Keith Lewis; Scott D. Nodder; Lionel Carter (11 January 2007). "Zealandia: the New Zealand continent". Te Ara: The Encyclopedia of New Zealand. Archived from the original on 26 June 2013. Retrieved 22 February 2007.